Mission Statement: To control the bed bug epidemic without polluting the environment or endangering humanity and becoming the leading manufacturer and service provider of green, chemical-free, convective electric heat. When you join the BedBug Chasers family, you will use proprietary equipment and methods to eliminate bed bugs in a non-toxic way. Since our heaters are more powerful and more efficient than our competitors, you will be able to treat larger areas with less equipment. Through strategic partnering with industry leaders, we have manufacturing and servicing capabilities of our BedBug Chaser proprietary heaters both in the US and the UK. You will have access to our nationwide fleet of generators, miles of cable, and millions of BTU’s worth of BedBug Chaser proprietary heaters. Unlike anyone else in the industry, you can dispatch enough heat to treat a single apartment or an entire building. When you start your BedBug Chasers business, you have the option of getting your business off the ground by renting or buying a majority of your BedBug Chaser heaters, generators and equipment making it one of the Best Low Investment Franchises. Once your business is established and growing, you can purchase the equipment you need, as you need it! Our business model has TWO distinct markets. Our primary market is providing subcontracted heat remediation services to existing Pest Management Professionals who choose to leave heat remediation to the experts. As more and more customers are demanding a completely green approach to bed bug control, BedBug Chasers stands ready to supply existing Pest Management Professionals with the industry’s best heat remediation services. 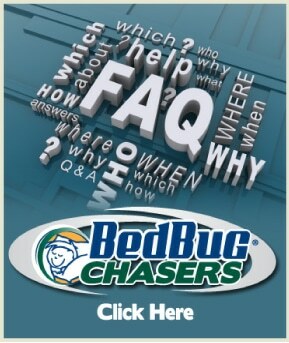 The BedBug Chasers equipment can also be used for many other commercial and residential purposes. You can customize services and products to offer portable container treatments, restoration services, duct disinfection services, temporary heating, power outage / disaster recovery services, etc.